I am really. I stumble along for ages, and can't seem to get an idea—and then suddenly, over night, I grok it. This hasn't happened yet with multi color yarns. I still buy them, and hope, (stupidly) that this time will be different. That this time, I will like how they knit up. They never do. I am not talking about self striping, or long color change yarns (like Patons Lace, or any other yarn that is similar to NORO's) I am talking about multi color balls with color changes ever 6 to 8 inches. I love how the yarn looks in the soft center pull skeins. But I always end up hating how they knit up! At LEAST, in my old age, I have learned some tricks to working with them. Knit and purl patterns help, and do slip stitch patterns. 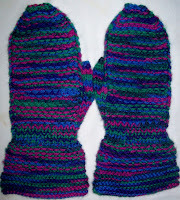 I like the 'Cobbled” front of these mittens much more than the stocking knit palms. Next row, Slip 1 with yarn on right side of work (for me working in the round that is a Purl like slip) and work 1 (for me, a Purl, but if working flat it would be a Knit)--repeat across the R.
then another R of Knits, and the next row, starts with a Worked stitch (Purl in the round, Knit if working flat) and slip one, repeated across the R.
It worked great in the cuff—where I worked a whole round in pattern, but once I started on the 'hand' part of the mitten, and was working a slipped/garter stitch on the front, and plain stocking knit on the palm--(cause the back of the hand and the front of the hand are really the same thing!) there was a problem. 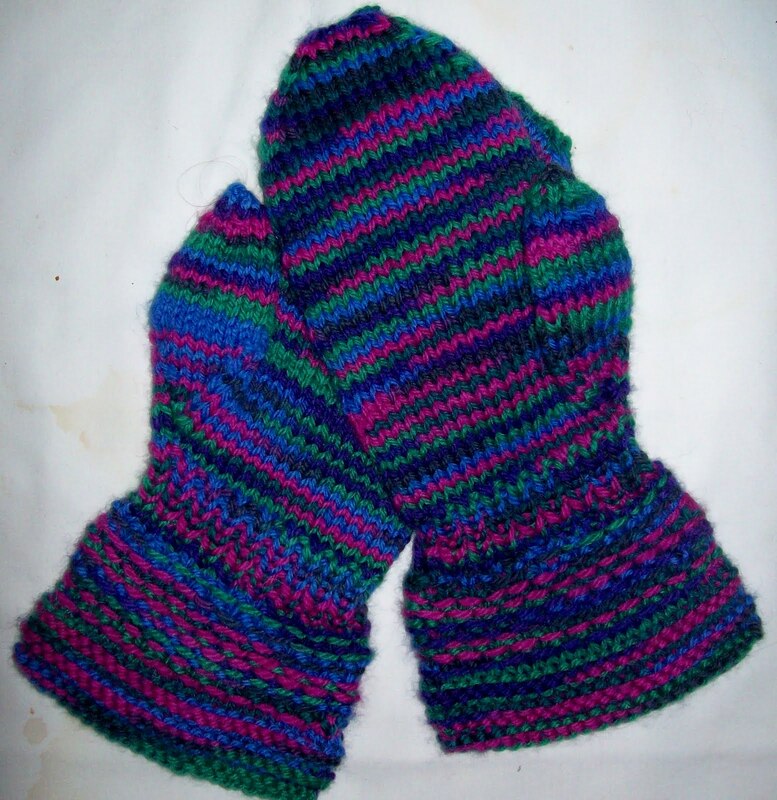 The garter/slip stitch side compacted more (the row gauge was very different) than the palm side. So ever 6 round or so, I worked some short rows across the back, and evened the gauge out. The thumbs are on the palm side, so they were stocking knit, too. The results works! The mittens lie flat, (and don't curl with the uneven gauge) and the colors are broken up in a more pleasant pattern. The bumpy ridges remind me of cobbled roads, (there are still some to be found in NYC) So they are cobbled back mittens. Now I have done my 3 pairs. Maybe I'll do another, but I promised 3, and can deliver as I promised!--Or maybe I'll just do a pair of fingerless gloves. I have some ideas, but, if will they become reality (and in time!) is another thing! I am bubbling with ideas of things to knit. I keep jotting down ideas so I don't forget them, and my list of ideas is like my stash--far beyond my life expectancy, even if i live to be 100!